I’m sure you know that having normal cholesterol levels is important! Cholesterol is one of the main problems in many parts of the world, and people are constantly trying to restore healthy cholesterol levels and find ways to get safe cholesterol levels when they get out of control. However, in order to really restore your cholesterol levels, you have to understand what cholesterol is. On this page you will find all kinds of great advice on understanding cholesterol numbers and cholesterol values, how to know what your HDL cholesterol levels and LDL Cholesterol level is, how to know if your cholesterol is out of control, reading a cholesterol level chart, and so much more. Don’t worry, the information on this page is not complicated and medical, but it is easily understandable and clears up many a cholesterol myth. What Do the Cholesterol Numbers Mean? 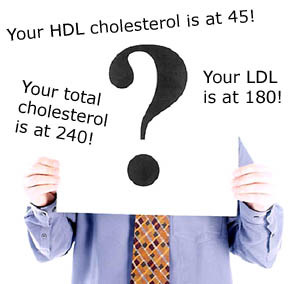 To put it simply, these cholesterol numbers basically tell you just how high or low your cholesterol levels are. It is important that you understand the meaning of these cholesterol values, as that can help you to know if you are in mild danger, serious danger, or safe from high cholesterol problems. The first thing that you need to know is that your HDL cholesterol is the good stuff that actually helps to get rid of the bad cholesterol in your body. You want your HDL cholesterol level to be as high as possible, and anything over 60 will mean that you are in great shape. If the HDL cholesterol level is between 40 and 60, you are starting to get into the danger zone. If you are a man, lower than 40 is a serious threat, while women with HDL cholesterol levels lower than 50 have a much higher risk of heart disease. The LDL cholesterol is the one that when unbalanced may lead to problems like heart attacks and strokes, and thus you want to keep it as low as possible. 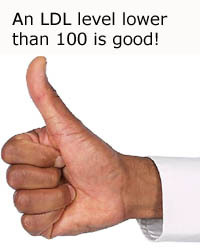 Those that are in perfect health will have cholesterol lower than 100, but higher than 130 means that you are getting into dangerous territory. If your LDL Cholesterol is above 160, you had better start making serious changes to ensure that it doesn’t get above 190 – a recipe for serious heart problems. Triglycerides is the most common form of fat that you will find in food, but it can be dangerous if the levels get out of control. A healthy level for those in perfect shape will usually be lower than 150, and the risk starts to climb as you pass 151. Higher than 200 is a serious threat, while those with triglycerides higher than 500 have very high and very dangerous levels of triglycerides. Your total cholesterol level basically tells you how high all the levels of cholesterol are – sort of like an average for your body. If your total cholesterol level is lower than 200, you have nothing to worry about. Once you crack 200, you should start worrying, with any number higher than 240 being a reason to start taking drastic steps to correct the problems. So above we explained the most common forms of cholesterol, but VLDL is one of the least commonly found forms of cholesterol that almost no one knows about. What is it, what does it do? VLDL cholesterol is very low density lipoproteins, and they are the form of cholesterol that contains more triglycerides than any other form. The high levels of triglycerides in the VLDL cholesterol means that your risk of coronary artery disease is much higher, which can lead to strokes and heart attacks. It is just as important to control your triglycerides as it is to control all other kinds of cholesterol, as that will help you to ensure that your VLDL cholesterol stays in check. If you are one of the people who has high cholesterol, a cholesterol and triglyceride lowering diet may be exactly what you need. However, how can you know if it’s time for you to start dieting and getting rid of your high cholesterol? After all, high cholesterol is a disorder that really doesn’t have any visible high cholesterol symptoms until it is nearly too late. How can I know if it’s time to start a diet to lower cholesterol? You have a heart attack or stroke – Usually high cholesterol levels will usually be impossible to tell, but the fact that you have a stroke or a heart attack can be a little indicator that your cholesterol is kind of out of control. Both problems are caused by fatty buildups that block blood from reaching the muscles, and the outcome can be fatal. 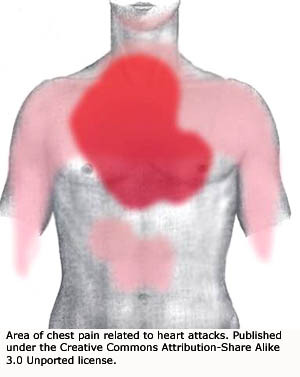 You have chest pains – Angina is a common symptom of high cholesterol, and you may feel like your chest is very tight or painful. The pain is not the same as the pain you get from a heart attack, but it feels painful because your heart has to work hard to force blood through arteries thick with cholesterol. You have xanthomas – Xanthomas is the fancy way of saying that you have fatty buildups around your eyes, palms, feet, knees, or elbows. These deposits are usually caused only when your cholesterol levels are very high. If you want to be certain that none of the above problems get out of hand, it is important that you get a regular cholesterol check to very that you have normal cholesterol levels. You can try using a cholesterol test kit or get a cholesterol screening, but having a cholesterol monitor test is very important. “Why is it so important?” you may wonder. Well, remember how cholesterol symptoms usually don’t show up until it’s too late? This means that the cholesterol is building up in your body over time, and only when it’s too late to do anything about it will the problems show up in the form of heart attacks or strokes. However, with a cholesterol check done regularly, you can be certain that your normal cholesterol levels don’t get out of control. 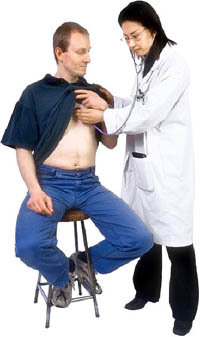 You are recommended to get a cholesterol screening done at least once every few years, though you would do well to check your cholesterol if you tend to eat a lot of greasy and fried foods, you are overweight, or you have a fairly sedentary life. By getting your cholesterol checked, you can be certain that you can catch the cholesterol before it gets out of control and take steps to correct the problems. So, your cholesterol screening came through and your cholesterol levels are very high. What can you do to attain safe cholesterol levels quickly before the high cholesterol cause problems? Follow a Very Low Cholesterol Diet – This diet consists almost entirely of fruits, vegetables, and whole grains, though legumes and soy are on the list for protein. The reason that this diet is so good is that it contains almost no sugar or fat, both of which the body converts to fat and cholesterol. It will be hard for you to follow this diet of all natural foods to lower cholesterol, but the fiber in your diet will be the key to getting rid of the bad cholesterol in your body. Take Strong Supplements – There are certain cholesterol lowering supplements that will be very effective at lowering your LDL and total cholesterol levels, while some will work to boost your HDL Cholesterol (see below for more supplements). Taking these stronger supplements, even though they are natural, may have some negative side effects, so make sure to check in with your doctor before you venture down that road. Drink Lots of Apple Cider Vinegar – Apple cider vinegar is an effective method of dealing with high cholesterol, as it contains certain properties that will help to thin out your blood. Thinning out your blood will help it to flow easier through your blocked arteries, possibly preventing heart attacks or strokes by ensuring that enough of the blood can reach your brain and heart. Do Lots of Exercise – One of the best ways to get rid of high cholesterol levels effectively is by doing exercise, particularly cardiovascular exercise. It doesn’t really matter what you do, provided you get your heart pumping and keep it working for at least 30 minutes a day. You will find that doing all kinds of exercise can help you to burn off the fat that is clogging your arteries, thus preventing problems from arising due to very high cholesterol levels. It may be hard to do these things, but it will be worth it if you can prevent a heart attack or stroke from ruining your life. Eat Blueberries – Blueberries are rich in antioxidants, and your body is desperately in need of antioxidants to fight off cholesterol. The reason for this is that the antioxidants prevent the cholesterol from building up on the walls of the arteries, thus preventing them from being blocked. Try Garlic – Garlic is a powerful vegetable that can help you with all kinds of coronary problems, including high cholesterol. It will help to thin out your blood even further, thus preventing clots or blockages. Stay Away from Dairy – Dairy products are high in animal fats, and these fats are the ones that jack up your cholesterol levels. Stay away from any dairy products, no matter how low in fat they are. Find replacements in order to control cholesterol levels. These few tips can help you to lower your cholesterol even further, helping you to get back to normal cholesterol levels that can be managed naturally. Phew, so you have find out ways of naturally lowering cholesterol to where it is manageable. Eat lots of oatmeal. Oatmeal contains lots of fiber, which will help to raise HDL cholesterol and eliminate LDL cholesterol. Eat lots of fish. Certain fish like salmon and tuna will be excellent to help you to control your cholesterol levels, as the Omega 3 fatty acids in these fish will boost your HDL cholesterol levels effectively. Eat some avocadoes. Avocadoes contain natural fats and plant sterols that will help you to naturally lower cholesterol to healthy normal cholesterol levels, but make sure to keep your consumption of avocadoes to a healthy minimum. Eat leafy greens. 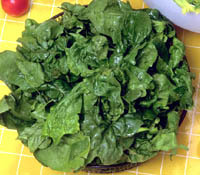 Leafy greens like spinach and kale not only contain a lot of fiber, but they also have a lot of other nutrients that your body needs to be healthy, such as folic acid. Eat flax seeds. Aside from fish, flax seeds contain more Omega 3 fatty acids than anything else, and eating more of them will help you to control your cholesterol levels and get them out of the danger zone. Bringing your cholesterol under control and getting it back to healthy normal cholesterol levels is important, and you can find ways to do so now that you understand about healthy and normal cholesterol levels.